Today's giveaway has me all excited for spring and summer. I saw the pictures announcing LylaLous on a photography blog a couple weeks before the shop opened. I started checking back regularly, because I knew the girls were in serious need of these, and boy do they look adorable in them. The construction of these clips/headbands is hands down the best I have seen. The flowers are the perfect size, not too large to overpower, instead just the right size to make a statement. One of the best things about LylaLous is the ability for heads of all shapes and sizes to wear them. So if you love your daughters headbands and clips, you can wear them too. They won't stretch out (they're metal) and you can make a statement of your own. Worried about the flowers being too girly, try their feather headband, the perfect accessory for a day at the park or a night out with your husband. It's that versatile. The perfect touch to a ponytail or bun! These adorable flower clips are lined with a velcro strip for a no-slip finish. Silk ranunculus flower with rhinestone center, with grosgrain covered single-prong metal alligator clip. 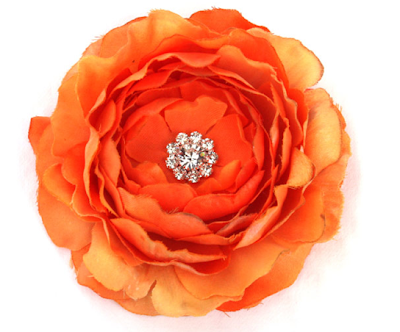 Flower diameter: 3.75"
Make an adorable statement with this fun accessory! These handmade headbands are comfortable enough to wear all day, and add the perfect touch. Silk daisy flower with rhinestone center with grosgrain covered thin metal headband. Flower diameter: 4.75"
Which LylaLous design is your favorite? Good Luck and Thank You LylaLous! I'm liking the green lou lou headband... I've been wanting to buy a new heaband! I am loving this one; Turquoise & Hot Pink Ruthie Headband, I need one!! I like them all! My very favorite is the Turquoise & Flame Lou Lou Headband. These are just darling! i love the turquoise and red. I am in love with the turquoise and flame headband. The black feathers would be like Puttin' on the Ritz. I am so impressed that all heads it fits! I love the Turquoise & Flame Lou Lou Headband and Light Pink Lou Lou Clip. I am loving the Black Feather Headband!! Love them all, especially the Ruthie or Daisy styles for our girls, and the Feather headband for me. I love all of the flower headbands, & can't wait to see her baby headbands when they come out! I like the red button headband. I have been wanting one of these. And my girls could really use the green lou lou. loving the combo of hot pink and turquoise! 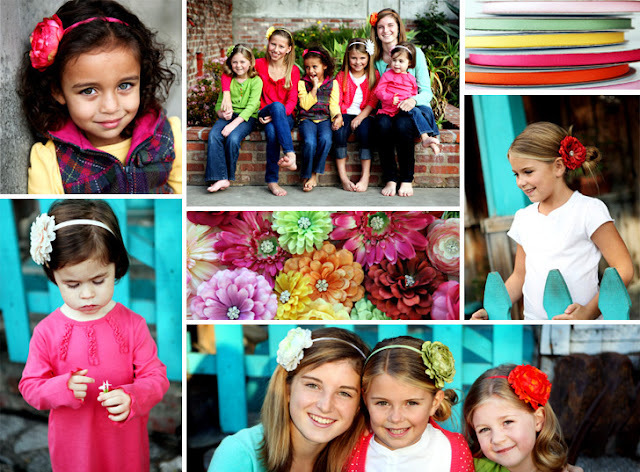 The Missy flower headband is my favorite, but I can see my girls wearing everything in the store! such cute headbands...all of them! i am loving the fiona headband. these are adorable. pick me pick me! I love these headbands. I'm always up for pretties in the hair, especially since Spring has arrived. Oh i would love to rock the feather headband! I love the turquoise headbands! These are so cute! I love all the lou lou headbands. The colors are great!!! the clips are lovely, and ranunculas are one of my faves. I love the flower headbands, especially the lou lou...too hard to pick just one color, though! 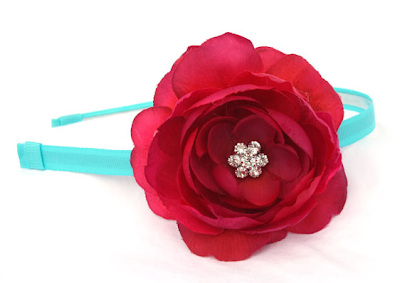 I think the trixie headband is just adorable, in any color! i just found out i'm having a girl and the turqoise headband i'm sure would look great on her! My favorite is the feather headband...so chic! The green lou lou is so cute. I love the Red Fiona headband. TOO CUTE! I absolutely love the Red Fiona headband - these are amazing and so cute!! How exciting! I am loving the Turquoise and Hot pink Ruthie Headband. So cute! just want to say what a great giveaway! We love our lylalous around here. They are well made and such fun! This orange flower would match the new dress I just bought my older daughter. PERFECT! My daughter would love the hot pink missy headband! Thanks for introducing me to LylaLous! I love the LouLou headband! have teh site bookmarked - am looking forward to the baby headbands!! I hope they get them soon. I love the Trixie headband. Gorgeous! I would be happy with any of them! But, I think my favorites are the Feather Headband and the Turquoise and hot pink Ruthie Headband. They are all super cute! The feather headband rocks, and I like the button headbands too. Good ideas. The green lou lou is to die for! Actually, they are all to die for!! oh...that feather head band is really cool and different! I love the button specialty headband. So cute, yet sophisticated. With my 4th boy on the way I've been looking for ways to make myself feel more girly. I love the Turquose & Hot Pink Ruthie headband. I also love the feather ones. So cute. they really are darling. love them all. I love the hot pink ruthie headband! Oh my...I would pretty much like the entire store though! these are so cute...I love the yellow flower clip, but I think I would have to choose the headband, it would work better with my little girl's hair at the moment. love the bright colors too!! I like the Ruthie and the button headband. so cute!! love the feather headbands and the turqouise and flame loulou headband. please. What beautiful bright colors. I love it all! But I think the feathers are my favorite. 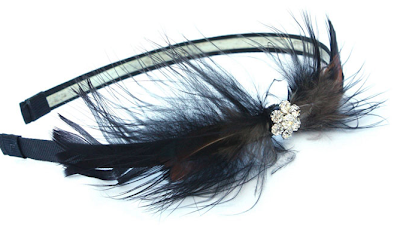 The feather headband is so delicate and feminine. I think that would be my favorite for myself! First of all, I'm a subscriber and I LOVE your blog! Also, this is the first I have seen LylaLous headbands and I adore them! I have a 9-month old daughter and would love her to have the red and turquoise one. The colors are perfect for spring and summer and it is darling!!! Thanks and keep up the great work! Wow! Sooo cute and easy to wear! I like the Fiona headband, but the feather headband is intriguing to me. Not really my style, but I like it...I think I would have to try it. I adore these headbands! I think my favorite is the Fiona headband. So lovely! I love the zoe flower headband or clips. Very adorable! the daisy flower clip is my fave! Great way to make one's little one look even more adorable! I loooove the red Trixie headband with the three flowers. I love the Fiona headband, so cute! I love both the turquoise flower headband or ruthie. I heart the Hot Pink Fire/Ice Fiona Headband! These clips and headband are so cute! I can't pick one!! Love the light pink Trixie, but am looking forward to the baby headbands since my peanut is a newborn. loving the lou lou clip and the flame and turquoise band! awesome! our collection of flowers is getting pretty ratty. i Love the turquoise and flame headband. I would be in serious fights with my daughter over this. i love the trixie in fire and ice! it makes me think of the headwear, BAN.DO... only affordable and for kids! LOVE it. I am loving the cranberry zoe clip! Thanks! Forget my babies, I want one! The pink Lou Lou clip is so cute for my boring ponytail. These pieces are absolutely gorgeous ... I can detect the superior construction from the photos. Great find! I love the black feather headband. I especially love the flame lou lou! I'm having some family pics taken soon, and I'd love this on my 5 year old. The Lou Lou headband is so cute! I love the Zoe headband! OOOOH! Love the fiona fire and ice headband...so delicate and sweet! And they ARE the right size. Gorgeous! I love the turquoise and lou lou headbands and i am definitely crossing my fingers. at 3, my daughter finally has enough hair to support some cute accessories! I'm liking the feather headband although the loulou flower headband is my favorite. I would love to have these for my 3 girls! my Favorite is the Turquoise & Flame Lou Lou Headband! Very fun! I adore the green LouLou headband for me and the turquoise and flame LouLou for Roo! I am in love with the simple white lou lou leadband! Please pick me! i love the feather headband, and will be having a lylalous giveaway soon, too! hooray! My favorite is the red Trixie headband, but there are so many more I'd like to have. I love the turquiose and red headband with the daisy rhinestone- would look so sweet on my little girl's head! Love them all and have 2 darling girls that would get good use out of them! Adorable! I love the feminine style of the Lou Lou clip. I love the Trixie and the Fiona Flower headbands. Thank you for introducing me to this wonderful site! Lots of pretty ones but I like the Zoe headband. I think Trixie is super cute! All are very cute the Trixie stands out to me though very cute! Love the Fiona! Anything pink for my girls. I love the turquoise and hot pink headband. They are all cute! These are precious! I love the Lou Lou in orange. My girl has wild, dark curly hair -- it would look fabulous on her. And momma could use it, too! :-)Though I'll never be as pretty as she! Thanks! I love the green lou lou headband. So sweet! I love the turquoise and pink ruthie headband! Red and blue is my favorite combo. I love, love, love these. The flowers are great. I love all the flower headbands. These are darling! I love the all of the clips, but the trixie, fiona and lou lou headbands are just adorable. Love the Turquoise & Hot Pink Ruthie Headband... so CUTE! I love the peach, cream and light pick "Lou Lou Clips" ... I want one in each of those colors! I'm loving the turquiose and blue (just for me!) and I have a little niece who is really into 'badges' as she calls them! I love the Zoe clip in green, it's adorable! I can just see the date night outfit now (topped off by that little beauty). I love the yellow flower you're giving away! For me, the green lou lou headband. For my daughter, the orange ruthie headband. Great products! So stinkin cute! I love the green Lou Lou. Heck, I like them all! They are all super cute. I'm torn--I'd have to go with the lou lou clips. They seem to work better in my girls' hair--but the hearbands are darling.